How does my garden grow? Weirdly, apparently. Did I mention that I made a carrot? Very well, then, consider it Mentioned. The Alleged Garden is in its usual late-summer stage of "ehhhfuckit", except for the part where after complaints from the neighbours I've been making a more active attempt to keep the tomatoes in check which has so far completely backfired in that trimming the leaves only seems to be encouraging one plant in particular to hyperactive growth, rather like shaving your legs. 'Sunsugar' is not invited back next year because, while it's prolific, it has no manners. 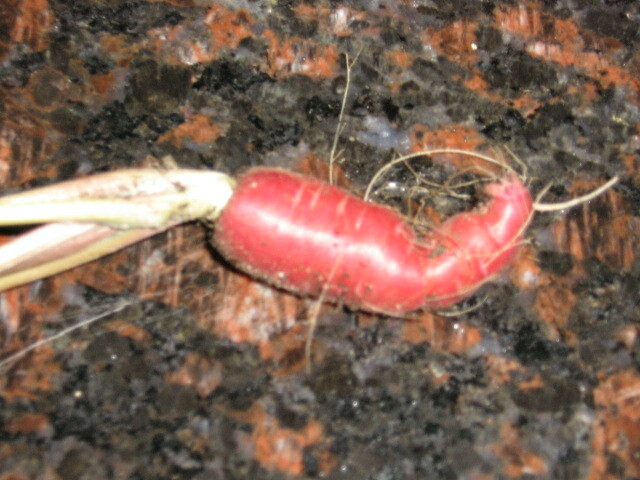 Interesting luminous pink carrot! Which breed of carrot is that?